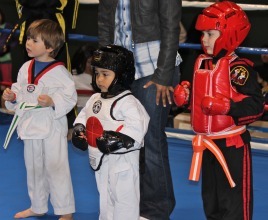 On Saturday, February 26, the first of a monthly series of WCK amateur Muay Thai/Kickboxing and MMA competitions took place. If we are to compare this offering with their first show held October 2, 2010 on the same Pala Indian Reservation, I’m certain most of Saturday’s competitors would agree the show was a bit of a downgrade. The one thing that wasn’t lacking was the passion and fervor of the people showcasing their talents. In Bout #1, Brandon Morris of Team Quest, Temecula, CA. 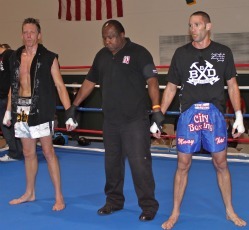 made quick work (1:24 of the first round) of Johnny Lyon of The Arena Muay Thai Gym in San Diego, CA. Morris, multifaceted, landed some impressive blows as he got inside Lyon’s kicking offense. In Bout #2, a super-lightweight bout, Tony Juan of Adrenaline MMA, San Bernardino, CA. prevailed over Ruben Dominguez of Las Vegas, NV. in a poorly received split decision. There was no doubt Juan got off to the quicker start with impressive kicks to the head and the landing of several overhand rights, but you couldn’t sell that notion to the partisan crown. Near the end of the second round however Dominquez’s confidence did build to the point where he was coming on. 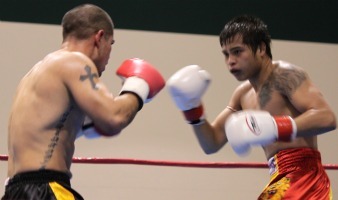 Then in the third and final round, Dominguez took control. Without a knockout in the third, Dominquez could hardly expect win. 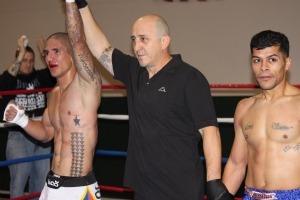 In Bout #3, Bradley Guachino of Pala, put a beating on Robert Holguin of Adrenaline MMA, San Bernardino, to get the win. Without the horn or bell to end round one, Guachino, who had Holquin pinned against the ropes, kept flailing away until the referee finally got the message. In round two the fighters started flying through the ropes. In Bout #4, Joseph Hernandez of Pacific Martial Arts in San Diego, a member of Team Eddie Loco defeated Marvin Madariaga of Blue Ocean Thai Boxing/Black House Team Nogueira, San Diego, CA. The first round went to Hernandez who scored a knockdown, caught Madariaga with several hard punches to the face and kicked exceptionally well to the chest. In round two, the momentum swung back and forth. 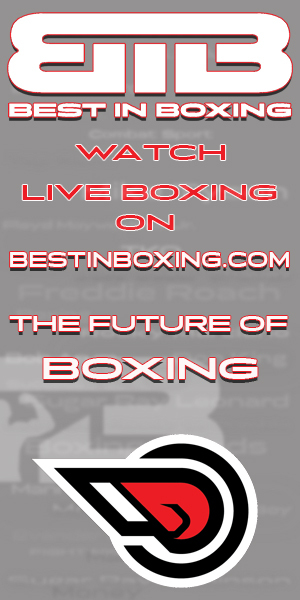 By round #3 Hernandez was in charge and kept landing left hook after left hook after Madariaga kept dropping his hands. Bout #5, a MMA bout, featured Tiffany “Time Bomb” Van Soest of Blue Ocean Thai Boxing and full time instructor at Black House Team Nogueira of San Diego, CA. 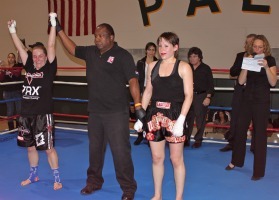 going up against Kate McGray of Dynamix Martial Arts in Los Angeles, CA. 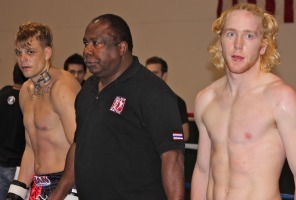 From the outset Van Soest was all over McGray using kicks and punches. After doing so well in round one, she took it up a notch and soon had McGray on her back and punching her face. 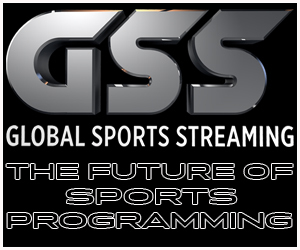 Unlike the men’s UFC matches where the referee stands idly by while a fighter receives a pounding, Saturday’s WCK referee was quick to act and called for an early stoppage before McGary got really hurt. Bout #6 between Justin Smith of City Boxing, San Diego, CA and Scott Venerick of Bob Chaney Martial Arts in Temecula, CA. had the most surprising ending. Throughout the bout Smith landed the heavier blows, scored several knockdowns and got inside Venerick’s defenses to land the stronger kicks plus the short right and left hooks. Venerick’s punches, though looping and far less effective, impressed the judges enough to have them rule the bout a draw. In Bout #7, A. J. Jimenez of Adenaline MMA appeared to have no problem with the much taller Steve Orosco of The Boxing Club, San Diego. 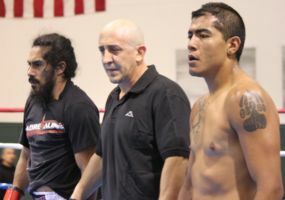 Almost immediatly Jimenez was on top of his opponent and punching him on the side of the head. They too flew through the ropes but miraculously went unhurt. 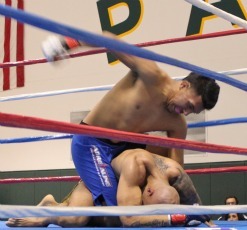 The end came in the second round when the grappling of Jimenez gained him a submission by triangle choke. Bout #8, a Muay Thai/Kickboxing five rounder, featured Amber Pope of CSA Gym, Dublin, CA going up against Kristina Alvarez of Blue Ocean MuayThai/Black House Team Nogueira, San Diego, CA fighting for the IAMTF US National Women’s Lightweight Championship. Since Alvarez was more calculating and tentative at first, Pope easily took the first three rounds by being busier, matching the kick count and landing more straight shots to Alvarez’s head. Like most professionals she knew to end each round with a flurry to impress the judges. By rounds four and five, Alvarez had finally taken control of the fight and started landing the better one, two combinations. At that point she had the confidence to stand toe to toe and began to dominate. Though the judging was close, overcoming the first three rounds proved impossible and the decision went to Amber Pope.